These online repositories of student learning have found their place at many universities. New technologies tend to hit the public in phases. First there’s the early adoption where forward-thinkers try it on like a pair of Google glasses. Then there’s the growing buzz as media and industry experts talk about it and, before you know it, we’re in the “next hot thing” phase – similar to where we were recently with massive open online courses, or MOOCs. And then there’s the “after” stage. Although some universities are still trying them out afresh, “after” (for want of a better term) is the stage now occupied by electronic portfolios, an online tool that emerged several years ago to allow students to store assignments and reflections around their educational experience. The tool tends to be used both in an official capacity for iterative course assignments and more personally as a student-experience archive. Way past trendy, e-portfolios (also called e-folios, blog folios, web folios, digital portfolios) are at that point in the technology curve where the tool has moved beyond the hype and even beyond the grumbling-about-the-hype to settle into position as just another tool in the kit. It’s at this stage where rational assessment can finally happen, along with speculation about the technology’s long-term usefulness. Even now, e-portfolio projects are still being launched. One of the latest to try it out is McMaster University, which rolled out its Learning Portfolio initiative this past fall. Along with their usual email accounts and such, each student received an eportfolio space. The technology is also being integrated into some courses to handle assignments. Rodrigo Narro, a fourth-year earth sciences major in the integrated science (iSci) program who is also university affairs commissioner for the McMaster Student Union, was part of a focus group last April to test out the system. His own e-portfolio exemplifies the tool at its best and most typical: blog-like, with banners, navigation menu and photos. Content-wise, Mr. Narro’s e-portfolio includes pages detailing his employment and his academic and extracurricular activities, along with a section called “Courses” describing the nuances of his iSci program and another titled “Experiences” containing photographs and reflections on his geological field trips to places from Illinois to Iceland. Mr. Narro describes himself as “not very tech savvy” and says there was a bit of a learning curve, but otherwise the tool was easy to use. “I think it’s a great tool to keep track of everything I do,” he says. For Susan Denburg, Mr. Narro’s use of the e-portfolio to record not only his courses but his extracurricular activities reflects the ideal she envisioned when e-portfolios emerged as a suggestion from a task force dedicated to improving the student experience. “That group came up with the notion that learning is a journey, that it doesn’t start at year one or end at year four of university, but starts beforehand and continues for the rest of your life,” says Dr. Denburg, the associate vice-president, academic, for McMaster’s faculty of health sciences. Extending the metaphor, the task force came up with the idea of the e-portfolio as trip diary to record individualized experiences. “Key to our e-portfolio is this notion of a personal diary where students articulate learning goals. Reflection guides the learning and decision-making as students go along,” says Dr. Denburg. Indeed, it is perhaps this dual function of reflection and record keeping that is one of the e-portfolio’s most compelling features. Although most students retain a box or two of old course binders in their basement for years after they graduate, there’s a tendency to set aside old assignments as each new year begins. 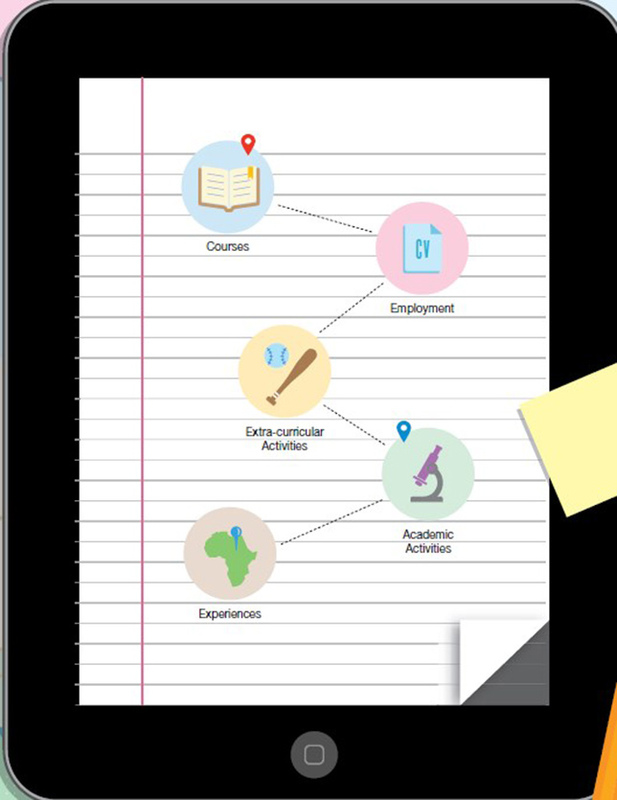 By recording each semester’s activities in the orderly format of the e-portfolio, students not only track assignments and activities but can easily access them year over year – inspiring greater reflection about their learning as it’s in progress, says Dr. Denburg. “Students are encouraged to identify their goals and become intentional about their learning. So they would think about why they’re making decisions to be president of this club, or work in a soup kitchen,” offers Dr. Denburg by way of example. This reflection helps students connect their activities to their goals, such as leadership development or career exploration. Of course, this is the ideal – to get there, students need to be motivated enough to engage in reflection and use the tool to its full extent. Wendy Carr, assistant director of teacher education at UBC, says teachers used to be required by the B.C. College of Teachers to have portfolios, but when the college was dissolved in 2011 the requirement was dropped. In spite of that, the faculty of education still assigns e-portfolios as a capstone project in its summer course, in which teachers-in-training are encouraged to include everything from teaching philosophies to lesson plans. Dr. Carr says it’s been interesting to watch the e-portfolio move from being optional to mandatory and back again, adding that the best results occur when they’re unconstrained by official requirements. At the University of Guelph, Kyle Mackie, manager of teaching and learning technologies in the open learning and educational support department, has seen several iterations of e-portfolio technology come and go, including tools developed in-house and commercial out-of-the-box solutions (Blackboard and Desire2Learn course management systems both offer e-portfolio tools). He’s consulting with faculty to refine the university’s existing technology. At Guelph, e-portfolios are used widely, in programs from the college of management and economics to the school of hospitality and tourism management. The e-portfolio is also central to the bachelor of arts and science program, where undergraduates choose a major from each domain, along with core courses as a cohort and lots of co-curricular programming. Dr. Thomason has students repeat the reflection halfway through and at the end of the term, to understand how they are changing and progressing. While he values the assignment, he says that the tool itself is “clunky” and needs work; it often takes up too much class time with its technical learning curve. “To a student now used to dragging their finger across a screen, it is like using a hand drill instead of a power drill,” says Dr. Thomason. His point is salient for the continued success of e-portfolios: they must be easy to use, and in most cases tailored to the particular programs where they will be seen as relevant. Even fans acknowledge it’s not so much the tool as the philosophy that makes e-portfolios compelling. After all, reflections can be done on paper, students can hand in multiple printed essay drafts, and assignments can be stored in a shoebox. With no shortage of web-based public portfolio tools – WordPress blogs, LinkedIn profiles, even Facebook timelines – e-portfolios will survive only if they are integrated and easy to use. UBC’s Mr. Wright arrived at that conclusion in 2006 when he decided not to recommend a campus-wide rollout of e-portfolios; his study showed the technology wasn’t yet mature enough and that one solution wouldn’t fit the diverse needs of different faculties. Beyond the benefits of capturing the learning journey and fostering more reflective students, there’s also the question of e-portfolios’ usefulness outside the university setting. At most institutions, the tool is hosted on the university server, where even student email accounts have an expiry date. Some out-of-the-box products have a post-graduation repository, but it’s up to the student to take the initiative to move the e-portfolio over. There’s also the question of how useful the e-portfolio may be when it comes to that other postsecondary predicament: finding a job. In an environment where short, sharp resumés are the norm, employers may not take the time to look at an entire e-portfolio, particularly for an entry-level job. Then again, a polished and well-presented body of work could give candidates an edge. Since employers’ responses are outside the students’ control, it may be better to view the e-portfolio’s vocational value in terms of the skills it promotes, says McMaster’s Dr. Denburg: in four years, students will be adept at organizing and curating their own works and therefore may be better resumé writers. At a personal level, too, there’s a good chance that students who embrace e-portfolios will have a nicer record to look back on than those of us whose only chronicle is that haphazard collection of boxes growing musty in the basement. Specifically, he accuses e-portfolios of being based on overly complicated technology with the fatal combination of the institutional need to control the systems (with less focus on making them compatible between universities or useful after graduation), while at the same time overly relying on individuals to take them up. And that may be the real test of e-portfolio success: whether students (and even professors) adopt the technology beyond required assignments and move into the nice-to-have archival territory that is the hope of e-portfolio enthusiasts. Then again, perhaps the definition of success could be something more modest – its value to the professors who see its benefit to their teaching, and that smaller percentage of students who decide to take it up more fully.